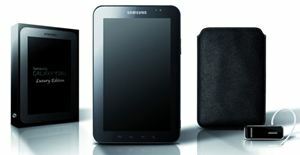 Samsung has unveiled luxury edition of its popular Android based Galaxy Tab tablet at the Millionaire Fair expo in Europe. The luxury edition of Samsung Galaxy Tab has been packed with an exclusive lather case and Bluetooth headset. Similar to the Samsung Galaxy Tab tablet, the luxury edition of Galaxy Tab is also featured with a 7-inch TFT-LCD capacitive touch screen with 1024 x 600 resolutions and runs on Android 2.2 Froyo operating systems. It boasts with a 1GHz Cortex A8 Hummingbird Application processor, 512MB of RAM, 802.11n Wi-Fi, 3G, equipped with dual cameras for capturing still images, videos or video calling, accelometer sensor and HTML Web browsing with Adobe Flash 10.1 support. Furthermore, it is Bluetooth 3.0 enabled and comes with a 400mAh battery. The Galaxy Tab Luxury edition with dimensions of 7.48 x 4.74 x 0.47-inch and weighs at 380g is expected to be available from 15 December 2010 until 31 January 2011 for the price of €749 or equivalent to $1000.